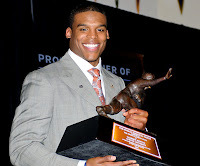 Despite all of the rumors and controversy during this football season, Cam Newton was always a front-runner for the 2010 Heisman Trophy. And it came as no surprise to anyone when he was announced as the winner of the 76th award. Newton received the third highest percentage of 1st place votes in history: 729 out of 926. He probably would have even got a higher number, except 105 of the voters left his name off the ballot completely, clearly in protest. Cam had a total of 2,263 points, over double what second-place Andrew Luck received (1,079) and third place LaMichael James received (916). Fourth place Kellen Moore received 635 votes, with 40 first place votes (quadruple the amount he earned last year). Moore received the sixth most points ever for a fourth place finishers (voters only rank first through third). The kicker to the whole night? Cam's extremely ironic statement in his acceptance speech. "My parents do a lot of things behind the scenes that go unnoticed." We know, Cam. Now would be a good time to stop talking. Controversy or not, he's an amazing football player. Congratulations to Auburn on the win, and to the state of Alabama, for having back-to-back Heisman Trophy winners. Onto the bowl games!